Hello minimalist friends. It's been more than a month since I wrote about my decluttering goals for 2014 so time for a quick update for both myself and you. I thought I wasn't making much progress but when I look back at my original goals I can see that there is some progress and plans are developing to make further progress. So how am I doing in each area? Declutter our loft space (this has now become our 'spare room' aka our dumping ground). No, this will have to wait until we have some warmer weather (but not too warm) as for now it's too cold to spend any length of time up there. Declutter our bedroom (nothing stashed under the bed, more clear surfaces). No, but I have been dreaming of a new look for this room, possibly a coastal theme. Declutter our paperwork (my least favourite job). Yes, I've done quite well with this one and have edited out quite a lot of unnecessary paperwork. I've also spent time looking into our personal finances and have found ways to save money by cancelling unnecessary policies. Have a serious attempt at decluterring my laptop. No. Continue editing my wardrobe. No, but I have decided to donate my unwanted clothes to charity as selling on Ebay and at car boot sales is so time consuming. I think I get more pleasure from donating to charity than making a few pounds. 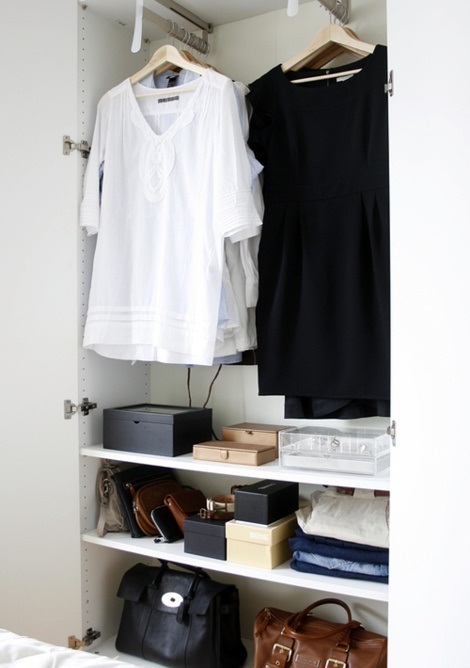 Create a wish-list to move my wardrobe nearer to a fully co-ordinating capsule wardrobe. Yes I now have a wish list that I am working from and my wardrobe is moving closer to a capsule wardrobe. Realising I had too many colour combinations in my wardrobe has been a breakthrough. I'll post about my wardrobe again soon. Redesign our small lawned garden into a low maintenance courtyard garden. No due to the time of year and weather. I'm really hoping this will happen sometime in spring though. Roll on sitting al fresco. Minimalise time wasted to allow more time for personal and health goals. Yes, with less work pressures I'm finding it much easier to use my time productively and approach life positively. I have been doing some paid work but it is not all consuming and has allowed me plenty of time for domestic tasks and personal time too. Since January I've been able to spend much more time on favourite activities like reading, baking and spending time with my family and friends. I'm much more content too. Minimalise money wasted by following a strict grocery budget to allow for a few new experiences and treats throughout the year. Yes, good progress with this goal so far. This has been my main focus since the start of the year and I'm really pleased with how much money I've saved on food with negligible negative effects. How about you? Any decluttering or simplifying news to share? I need all the inspiration I can get! Is that your wardrobe? It looks incredibly inspiring. So tidy and organised. I wish I could get mine in some kind of order but I do find it hard to throw old favourites out. Hi! The baby years are definitely the years when clutter builds up without you even noticing because you're so tired and busy. Plenty of years left to declutter! Having decided to donate to charity rather than Ebay some extra items of clothes, I am now procrastinating as to when I should get round to getting sorted. I also find I take a while to become unattached to clothing items even though I might not wear them anymore. Claire I think you have made fantastic progress with your goals so far - and I've always found it easier to really concentrate on a couple at a time to get results. Donating your possessions is a great idea and I feel less guilty about the cost of unwise purchases if I know I'm helping a charity. Limiting colour choices has really helped me in my wardrobe editing too and makes creating those capsules really easy. Lovely to hear you are more content and spending quality time with family and friends and thanks as always for the inspiration you give us all. Thanks for the continued inspiration Claire. I've done a bit of decluttering here, some old sheets and towels to recycling, a couple of DVDs and a cot bed sold on Ebay. I need to stay focussed on it though and try a bit harder! I love a bit of colour in my wardrobe too. I find I'm veering towards soft greys more than black these days and I adore teal. My new glasses have teal in them to coordinate the look!!! I agree with you Swissrose, the cream/beige/off white/grey with maybe a pair of black trousers and one red top look lovely in photographs but are not for me, I love colour too. It's interesting as things do tend to drift into colour blocks so it's still a controlled amount of clothing but with plenty of excitement. Big snow day today, staying cozy inside, little babe is a bit manic, so I decided to have her "help" me sort through the sock bin - get rid of the holey, single ones. Managed to cull out enough that I could move them into a smaller basket. Yeah! Hi Claire- I am having a major focus this month on simplifying my space and reading how someone else is doing with similar goals does help. I have so far done my dressing table drawers and quite a bit of the paperwork in the office - have yet to do a post about it but reading yours certainly motivating me. The 'stuff' mountain for me to give to charity / sell on ebay is mounting in our spare room. I am putting things in there to see if I can do without them before getting rid all together! For those interested in minimal wardrobes and with a bit of time to scroll through, the comments on this page http://jezebel.com/5733078/can-you-wear-six-items-or-less make fascinating reading and vary from monochrome to colourful - certainly extremely reduced uniform idea. Enjoy!